Ellen R. Stofan '83, D.Sc. '16 and Timothy P. Dunn '83 — two of William & Mary's most distinguished alumni leaders — are fueling innovative research efforts and programs across campus with a significant commitment to the For the Bold campaign. A large portion of their investment will provide programmatic support and seed funding for faculty and student-initiated projects that fall under the umbrellas of the Reves Center for International Studies and the Institute for the Theory & Practice of International Relations (ITPIR). "This marvelous $6.3 million gift will help prepare generations of our students to make a difference for the better in the complex world where they will live and work," said William & Mary President Taylor Reveley. 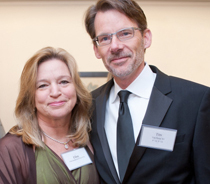 "Ellen and Tim are among William & Mary's most loyal and generous graduates. They have served alma mater in countless ways, including the most senior, and given with great generosity to help meet its needs. Their support for expanding the boundaries of our collaborative research and discovery is especially striking." Support scholarly efforts that allow students to develop cutting-edge solutions to today's pressing global challenges. The couple’s gift also supports scholarships, geology research, women’s and men’s soccer, environmental sciences and as previously announced, William & Mary Law School’s H. Stewart Dunn, Jr. Civil Liberties Project. "We both have careers that are globally oriented and believe that in order for students to succeed in their future professions, global perspectives must be infused in everything they do," said Stofan. Dunn added, "William & Mary is a leader in preparing students to think and act globally and we wanted to build on that by providing students with additional opportunities to be involved in as many international experiences as possible." The Reves Center was founded in 1989 with the mission of supporting and promoting the internationalization of learning, teaching, research and community involvement at William & Mary. Every year, the faculty teach and mentor students from nearly 60 countries to engage in research, service learning and social entrepreneurship on every continent. ITPIR — a joint initiative of the faculty of Arts & Sciences and the Reves Center — was established in 2008 to advance interdisciplinary, collaborative, internationally focused research that employs rigorous social science methods to make meaningful contributions to international debate, policy and practice. ITPIR is home to several groundbreaking programs such as AidData, the Center for African Development, the Project on International Peace and Security and the Bosnia Project, among others. Nearly 200 undergraduates participate in transformative international research and mentorship experiences through ITPIR on a yearly basis. As part of the For the Bold campaign, Reves and ITPIR aspire to raise $27 million to help fund scholarships, teaching excellence, collaborative research and programs that create global citizens who have a strong passion for driving positive change around the world. William & Mary also seeks to raise the number of undergraduates participating in study-abroad programs from the current 50 percent to 60 percent by 2018 — this will help solidify its ranking as the No. 1 public university in the U.S. for undergraduate study-abroad participation. “Tim and Ellen are extraordinary people. They have pushed and helped William & Mary for a long time to become a global force,” said Steve Hanson, vice provost for International Affairs and director of the Reves Center. “With this remarkable gift, we just took a giant leap forward in that direction." For Stofan and Dunn, giving time and resources to causes they are most passionate about is second nature. "We are proud to move William & Mary forward, to make it a better place for students today and tomorrow. This is a great opportunity to be part of our alma mater's history for all time coming," Stofan said. Dunn added, "Students and faculty at the university are working on some pretty remarkable things and we hope our gift will strengthen the high-quality, high-caliber education the institution has a strong tradition of providing." Stofan is a planetary geologist who studies volcanoes around the globe and on other planets. Dunn spent the bulk of his career as a global investment professional. The entire family has lived abroad and travels extensively. Two of their three children, Ryan ’10 and Emily ’14, graduated from William & Mary. Their daughter Sarah is a member of the class of 2018 at the University of Edinburgh. Additionally, Dunn chairs the Reves Center Advisory Board and formerly served on the William & Mary Board of Visitors. Stofan is a current trustee and former chair of the board of the William & Mary Foundation. Sue Hanna Gerdelman ’76, campaign chair, said, "It is inspiring to witness transformative gifts such as this that have such wide-ranging impact on the William & Mary community and beyond. We are all incredibly thankful to Ellen and Tim for advancing these important causes and for making a difference in the lives of others." Transmedia: Toward a deeper understanding in Ireland. In the dance studio: Rehearsing with Laxmi Narayan Tripathi. 'Women Out Loud': Tack lecture excerpt. Geology in Norway: COLL 300 field course and paleoclimate research.